What to Wear with a Tweed Blazer | Vintage, Of Course! As soon as I saw the cover of the October 2018 issue of Vanity Fair, I knew what I wanted to do for this month’s styling tips. Felicity Jones is pictured wearing a black-and-white herringbone jacket with a simple white shirt, open at the collar. Her lapel is adorned with a gold and diamond brooch by Van Cleef & Arpels. Herringbone, houndstooth, and other tweed patterns have always appealed to me and have never gone out of style. This photo (shown above) inspired me to put together a group of outfits to give you ideas for what to wear with a tweed blazer. Each of these ensembles is a variation of what Jones is wearing. I’ve added jeans, to keep the looks in the smart-casual category. You can substitute trousers or a skirt for a dressier version. Some of the jewels are brooches; others are dress clips – a type of brooch with a hinged, double-prong mechanism that works particularly well with weightier fabrics. And you’ll notice that I’ve included jackets in various styles, to show you how to adorn them. As usual, I’ve assembled outfits for both cool and warm color palettes. If you haven’t yet experienced seasonal color analysis or read my article How to Find Your Best Colors, let me define these terms. Cool palettes – colors with blue undertones – are for those whose season is Winter or Summer. Warm palettes have colors with undertones of gold (for Autumns) or yellow (for Springs). Winters’ hues are vivid, while Summers’ are more muted. These ensembles feature colors that flatter both seasons. The first example – Get the Look – is similar to the Vanity Fair cover photo. 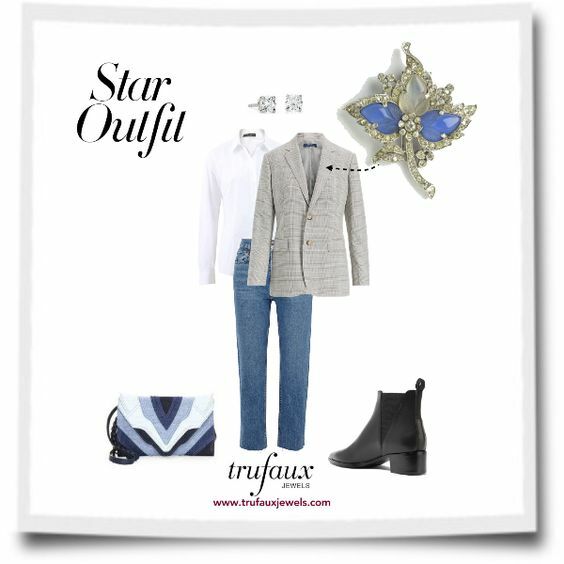 This outfit features blue jeans with a white shirt and a velvet blazer in a black-and-grey herringbone (zigzag) pattern. I’ve chosen this Diamanté Floral 1950s Brooch by Miriam Haskell because it’s cool in color, bold, and textured enough to stand out from and compliment the patterned jacket. 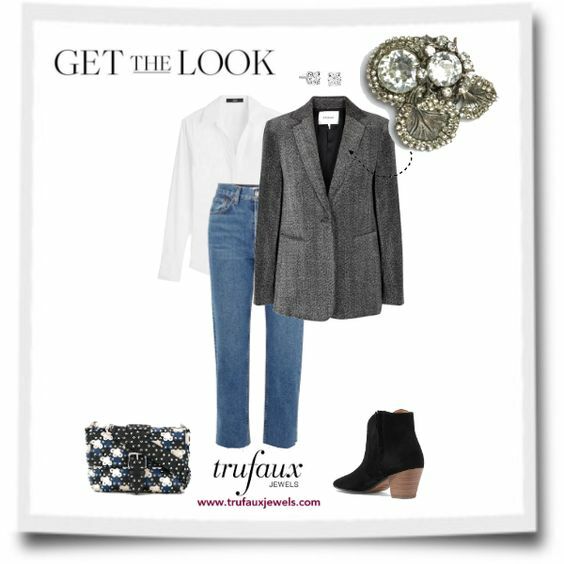 Black suede ankle boots, a black-blue-and-white flower-patterned bag, and diamond studs (faux or real) complete this look. 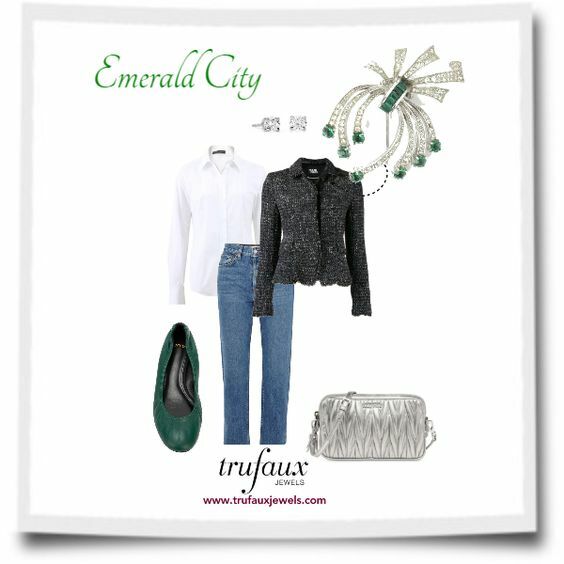 Emerald City, on the right, has the same style of jeans and shirt topped with a navy-tweed jacket. Because it has a round collar but no lapels, you would wear this Emerald, Diamanté & Sterling 1940s Dress Clip on your shoulder. The combination of stone shapes and their contrasting colors make this piece rich and versatile. I particularly like pairing emerald with navy. Green ballerina flats, a silver bag, and diamond studs complete this ensemble. For That Touch of Pink, I’ve accented a white shirt and black jeans with a mauve tweed blazer. It’s just the right intensity to sport this Black Enamel & Diamanté 1950s Brooch by Marcel Boucher. This superb piece comes with matching earrings, which you could wear with the brooch or on their own. I’ve kept things simpler here with diamond studs. Black flats and a black-and-white patterned bag finish this ensemble. Star Outfit features a man-tailored blazer in grey-and-blue glen plaid. This 1940s Fur Clip by Trifari adds the right amount of glamour. It has acorn-shaped, molded chalcedony and moonstone glass stones within a diamanté-outlined maple leaf. 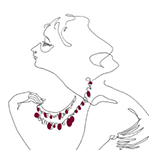 Known as fruit salads, these colored stones imitate the Indian Moghul-inspired carved gemstones, first introduced to Western fine jewelry by Cartier. I’ve added a patchwork bag in blue hues with white and black boots. Autumns’ colors are earthy, while Springs’ are like fresh flowers. These outfits feature hues that flatter both seasons. 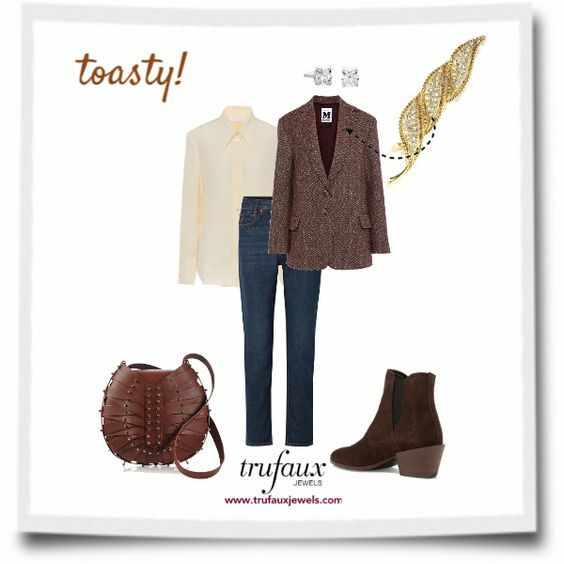 On the left – Toasty – features dark-denim jeans (which work for a warm palette) with a beige shirt and brick-red tweed blazer. The lapel is adorned with this Diamanté & Gold Leaf 1950s Brooch by Hattie Carnegie. I chose this piece for its shape and the ropes of warm, gold-tone metal that outline the stones. Brown-suede ankle boots, a textured brown leather shoulder bag, and diamond stud earrings complete the accessories. Let the Sunshine In, on the right, shows brown jeans topped with an ivory shirt and ecru tweed jacket. This one, without lapels, is different for another reason – the pattern is formed in the weave of fabrics in a single color. I’ve placed the Citrine, Pearl, & Gold 1950s Brooch by Elsa Schiaparelli on the jacket shoulder. The faceting of the large center stone is known as a dentelle – it forms an eight-pointed star. 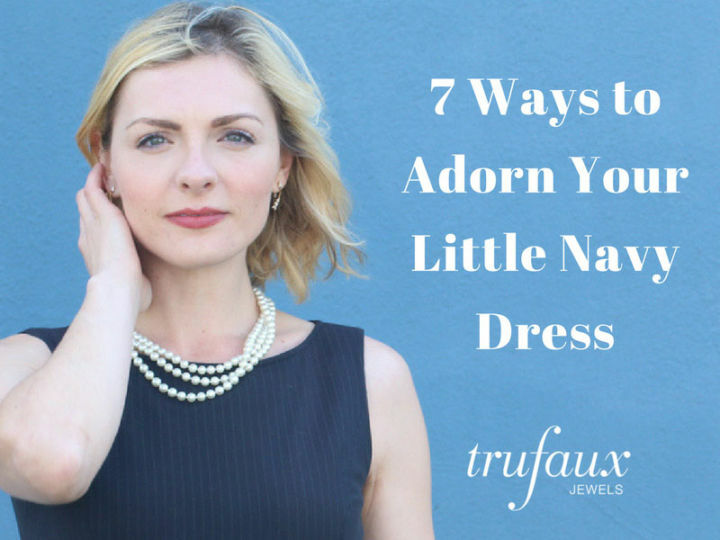 This jewel comes with matching earrings, but you could wear simple pearl studs, as shown. 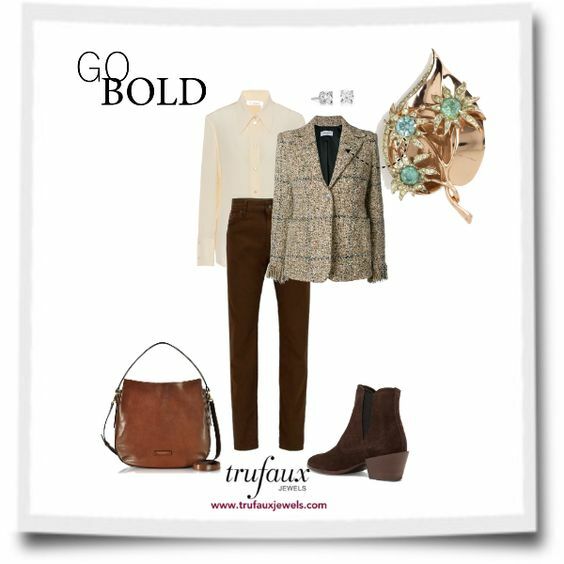 A patterned hobo bag and brown-suede ankle boots complete this ensemble. I named this outfit Go Bold because of this spectacular Aquamarine, Diamanté & Rose-gold on Sterling 1940s Brooch by Coro. Warm in color and bursting with personality, this jewel makes a statement on a tweed blazer (or anything, for that matter). I’ve paired it with a beige shirt, brown jeans, and leather accessories in brown hues. On the right – Independent Woman – features a navy tweed blazer that also appeared in an outfit in cool colors. Navy is one of those hues that can go either way. I’ve secured its warmth by adding dark-wash jeans, an ivory shirt, and gold jewelry and bag. With this style of jacket, you’d wear this Gold on Sterling Leaf & Berry 1940s Dress Clip by Nettie Rosenstein on your shoulder. 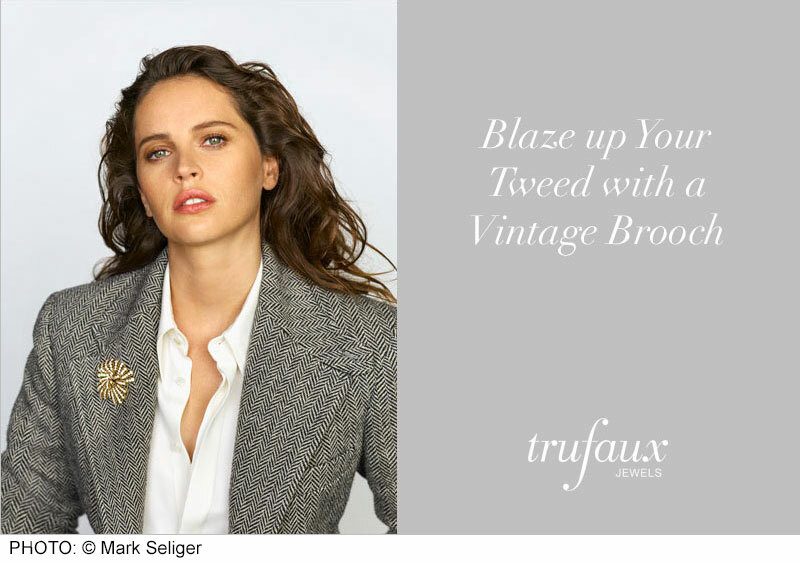 Visit the Brooches & Pins and Dress Clips collections on the TruFaux Jewels website to see additional tweed-ready pieces from the 1920s-1950s. Donna Bishop, CBC Radio’s fashion columnist in Toronto, recently told the story of tweed. She described this coarse-wool fabric as originating in the Scottish Highlands and having “strong associations with heritage … Tweeds have long been associated with the conservative, upper-crust of Britain”. In the 19th century, many British noblemen bought estates in Scotland for leisure activities. Tweed became the durable, go-to fabric for outdoor sports such as hunting and fishing. Following the lead of Prince Albert, who bought Balmoral in 1848 and designed The Balmoral Tweed, estate owners commissioned their estate’s special tweed. Then the fashionable Duke of Windsor made tweed more “mainstream” by introducing it to Savile Row, the heart of traditional men’s made-to-measure tailoring in London. According to The Curiously Compelling Story of Tweed, “the cloth has experienced a renaissance in recent times and now carries with it a certain sophistication. A long line of subculture movements such as the British Indie, hipster, Sloane Rangers, and preppies has enthusiastically adopted tweed as a part of their wardrobe repertoire.” From my perspective, the number of women’s fashion designers who have incorporated this heritage aesthetic into their fashion lines has grown. And they have gone beyond the traditional earth tones and designs, introducing modern colors, patterns, and styles. No longer limited to the traditional one-button blazer with lapels, tweeds form many jacket styles, other types of attire, and even accessories such as luggage and backpacks. Glad you liked it, Beth. Thanks for writing. Thank you Barbara for your wonderful blog this month. It has been a long time since I have seen a fashion magazine feature a look that included a brooch. Felicity Jones looks very stylish. I really like your sets of “Emerald City” and “Independent Woman”. Wish I was in a downtown Toronto Hotel today with one of those outfits on, planning on lunching in one of their establishments. Thanks for letting me have a little daytime fantasy. Keep up the good work. It is exactly what I what to see and feel. I’m glad you liked this post, Patsy. “Emerald City” is my favourite because I like that colour so much. Thanks for writing!